As you might have seen on my Instagram stories, this past weekend Grace and I threw a surprise party for our best friend Tina! This was my first time throwing a surprise party for anyone, so I'm by no means an expert. But, I was really happy with how it went, so I thought I'd share some tips from what I learned! A really sweet suggestion I got from my Survey a few weeks ago was to share some posts on hospitality, decorating, etc. That inspired me to write this post! That's Tina in the middle. Grace has known her since college, and I met Tina when I moved to California a few years ago. Tina is also our neighbor in West Hollywood! We go over to her apartment at least once a week (to watch the Bachelor), and sometimes twice a week if Drag Race is on. She's one of the most loyal people around and we just love her! A couple of months ago we were talking about Tina's birthday (Grace and I get REALLY excited about friends' birthdays and often discuss them months in advance, haha), and for some reason, the idea to throw a surprise party popped into our head. We've always wanted to throw one because they're so fun. But it's really hard to keep the person from suspecting something. We realized Tina would probably not expect us to throw her a surprise party, so it was the perfect cover. With that in mind, my first tip for throwing a surprise party is to pick a time, occasion, or person that is low key/unassuming. I feel like surprise parties can be stressful when they're on the person's actual birthday, and you have to convince them that no one could hang out or that everyone forgot their birthday. To me, that kind of ruins the fun and celebration. So in this case, we actually had Tina's surprise party a week before her actual birthday to throw her off. I also think a surprise party could be really fun for a non-birthday occasion, like a bridal shower, congrats party, going away party, etc. I think it's a lot less suspicious for those types of occasions. My next tip is to keep it simple. Our plan was to take Tina out to dinner at La Boheme in West Hollywood (SO good! ), and at dinner casually mention that I had baked a dessert back at our house (we all live really close together so it makes sense to just stop by our house on the way home to drop her off). Key to all of this was to pick Tina up, so at that point we had her captive until we brought her to the party, haha! Again, it made sense because we told Tina we wanted to drive so she could kick back and have some drinks at dinner. We tried to keep everything within the realm of what seemed logical, so we didn't tip her off that something was going on. Also in terms of keeping it simple, we went really basic with the decorations, food, and drinks. Planning a surprise party has enough complicated elements as it is! Because we were taking Tina out to dinner ahead of time, we just had a few store-bought snacks at our house for the party. We also got a cake decorated with a RuPaul phrase (Tina, Grace and I watch a lot of RuPaul together). Speaking of keeping it simple--we actually recycled this birthday banner! Grace ordered it on Etsy last year for my birthday party. I have a drawer in our bar area with all kinds of party decor (I have birthday banners, Happy New Year banners, rainbow Pride banners . . .) it makes things really easy when it comes time to throw a party. And I'm always adding to my collection! 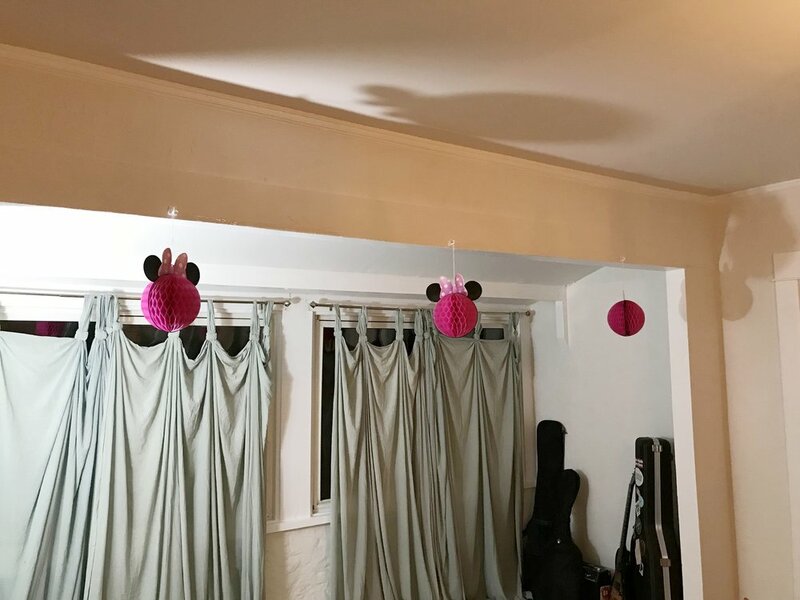 In case you can't tell, these are Minnie Mouse party decorations. I loved how pretty the Chrome balloons turned out. Last "keeping it simple" tip: don't feel like you have to buy every type of alcohol under the sun (if you're choosing to serve alcohol at the surprise party). In my experience, if people are really particular about what type of alcohol they'll drink, they will just bring their own! For this party, serving about 15-20 people, we bought: a case of beer (24), a bottle of vodka (could also use gin), a bottle of bourbon, a couple bottles of champagne, some flavored La Croix, grapefruit juice, and tonic. That amount was plenty, and everyone seemed happy! Another thing that really helped us have a successful surprise was recruiting friends to be the "point people" for coordinating the surprise. We asked a few friends to come over about 30 minutes earlier than everyone else, and we left a key for them and told everyone else to text them with questions. That way, while we were at dinner with Tina I wasn't stressing about whether people were arriving okay. I knew our point people had it covered! Seen in the picture above, before we left we set out a bunch of party hats, noisemakers, fun glasses, etc. I think it makes the surprise feel extra festive. For the actual surprise, we decided to leave it up to our friends what they thought would be easiest and most effective. They ended up hiding off to the side in a nook off of our dining room, and then when we walked through the door, they jumped out and surprised Tina. I texted the point people when we were parking the car so they could get ready. When we walked in, they actually waited a beat before jumping out, and then they all broke into song for "Happy Birthday" (much to the embarrassment of Tina). It was SUCH a fun moment to fully pull off the surprise, plus to see a bunch of our friends all at once! For the rest of the night we mostly just hung out, caught up with friends, and celebrated Tina! Tina is very beloved, so it was awesome to see so many people from various facets of our friend group all come together. My brother got to meet Bean for the first time! This picture is so funny to me. Parties seem to make Willie tired, and he usually retreats to his bed partway through. This time, he hopped right up into our bed, and of course some of our dog-loving friends were not far behind. I hope you enjoyed reading about our first surprise party! This was also our first party in our house (we've had a dinner party but not a bigger group like this), and it makes me so excited for lots more.